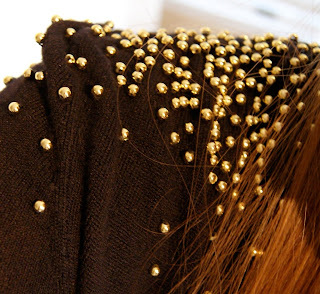 My sister's black cardigan with gold ball embellishment. We have a rule when sharing clothes -- always give each other credit. If someone says, "oh I like that sweater!" my response must be "thanks, it's my sister's.."
Anyways. I hope you had a fantastic Tuesday. January 12th -- how'd it get here so fast? So, I've mentioned before that I had been in an art rut. Well, frankly, I believe that was ED telling me I was in an art rut. Yes, that stinker is at it again. He's guilting me into thinking that because I was skinnier and better at my ED last year, my art work was better. I have two things to say to this. One -- last year I had absolutely ZERO of a life and didn't do anything else besides school and ED, no wonder I had so much time to draw. Two -- SCREW YOU ED! My artwork is always good! It's amazing how deceiving my own thoughts can be. I thought the truth was that my art was better last year than it is this year, but in reality, it's just ED disguising himself once again. Think things through, understand your thoughts. You could be skimming over some undetected lie that seems like the actual truth! Well that's about it for tonight. I hear my yoga mat calling me! girl you're so smart, and strong. you're right, your artwork always rocks. always. i'm going to be practicing my thinking things through, thanks dear! 1. You rock your sister's sweater. hands down, fantastic. I LOVE THAT PEACE SIGN SHIRT GIRL!! i wish i had a sister to steal clothes from! though my mom dresses cool, so sometimes i borrow hers ;) cute outfit! Sometimes when we get wound up in our lives we forget about the things that make us truly happy, like making art. I'm glad you found the source of your rut and decided to kick it to the curb! "I hear my yoga mat calling me!" --i hope you had a wonderful practice. namaste my friend! I wish I had a sis to share clothes with! Good job telling ED who's the boss. Your artwork is always good, especially without him sitting on your shoulder! Stay strong! Love the life lesson and love you! And hell ya, your artwork is ALWAYS THA BOMB! love the cardi! Esp the last photo where is sparkles! First of all, I'm obsessed with your cardigan and your boots - your style is truly gorgeous, Emily! I can never resist it! I love that rule! though whenever someone compliments something I'm wearing that may be my sister's.. I am always tempted to jsut let them think it's mine. te he he.